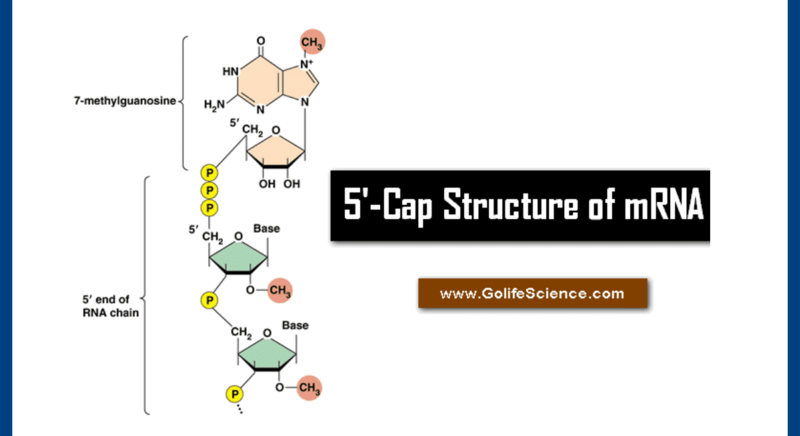 Cap structure in mRNA (Guanyl cap) is a chemical modification of mRNA molecules in eukaryotes, which drastically increases the stability of RNA and important for the transport of the RNA out of the nucleus into the cytoplasm and the subsequent translation of mRNAs by the ribosomes. It usually is a modified Guanine nucleotide which during the transcription of the gene on a rare 5’→5 ‘phosphodiester (is attached to the head end of the RNA capping). The reaction starts already after a few nucleotides of the mRNA of the RNA-polymerase have been linked. Capping can thus be regarded as cotranscriptional, even if it is just as well by the principle transcription might take place. In contrast, the splicing and polyadenylation (E.g. : Tailing) post-transcriptional processes, the waste after the mRNA from the RNA polymerase start. As an alternative to cap structure of some RNA viruses for the introduction of translation IRES or cap-independent translation element used. Capping is except for mRNA with many non-coding RNAs found. 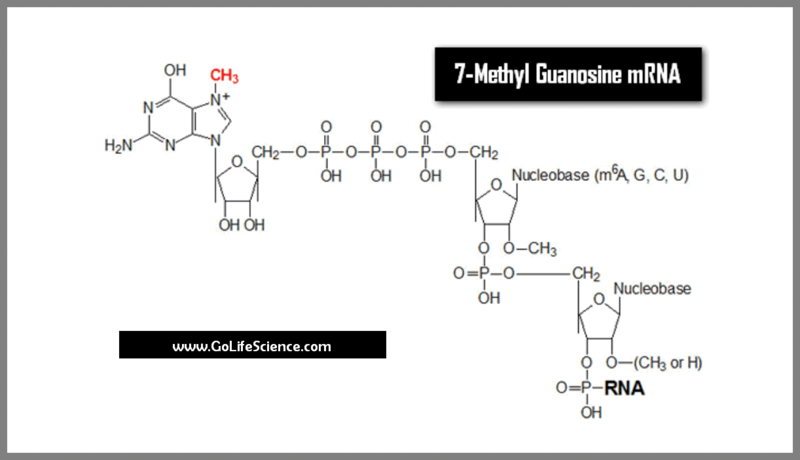 In mRNAs that are transcribed by RNA polymerase II, we find the classic methyl-7-G-Cap. Here (after hydrolysis of the terminal phosphate through the γ-triphosphatase) by the so-called capping enzyme A GMP residue (of GTP) in the form of a 5′-5 ‘triphosphate linkage transmitted to the 5′-end of the RNA and then at 7-position of guanine by using the mRNA cap methyltransferase with the consumption of S-adenosylmethionine (SAM), a universal methyl group donor, methylated, it results: 5’-5 ‘m 7 GpppN. In addition, there are further methylations of the first bases of the mRNA in position 2’, then one speaks of Cap1 (only the first base methylated) or Cap2 (the first two bases methylated). Furthermore, one finds for example in trypanosomes far more complex cap structures, in which not only the first nucleotide is modified, but also subsequent (E.g. : Trypanosoma Brucie Cap-4). Transcripts of RNA polymerase III in receiving these 5 ‘cap structures, wherein a few RNAs found but a mono-methylation of a γ-phosphate group (such as U6 snRNA). Some viruses show a peculiarity in the biosynthetic pathway of the cap structure: GTP is first methylated and only then transferred to the RNA. As well as the poly-A tail at the 3-‘end of the mRNAs and cap structure in mRNA plays an important role in stabilizing the molecule. Without this structure, the mRNAs in the cytoplasm quickly degraded by exonucleases in 5′ → 3’ direction. Even when discharging the RNA from the nucleus through the nuclear pores in the cytoplasm (RNA export) the cap structure in mRNA plays an important role. You will during transcription from Cap-Binding Complex bound with other factors ensures effective transport in cooperation. Is of crucial importance, the cap is also in the initiation of translation. Both bound by CBC (during the first round of the translation) as well as by eIF4E (while all other rounds) it ensures that the ribosome is recruited and begins initialization.This results in a ring closure of the RNA (closed loop model of translation), in which the 5 ‘end interacts with the poly-A tail (about eIF4E, eIF4G and cytoplasmic Poly-A binding protein (PABP)). Because some viruses replicate exclusively in the cytoplasm, they receive from the cellular machinery no cap structure. To compensate for the disadvantages that this entails, steal a cap of cellular mRNAs, one speaks of Cap-snatching. An mRNA of the host organism is thereby close to the 5′-end split (which indeed the cap bears) and a so-called capped-leader to be used to initiate viral translation. 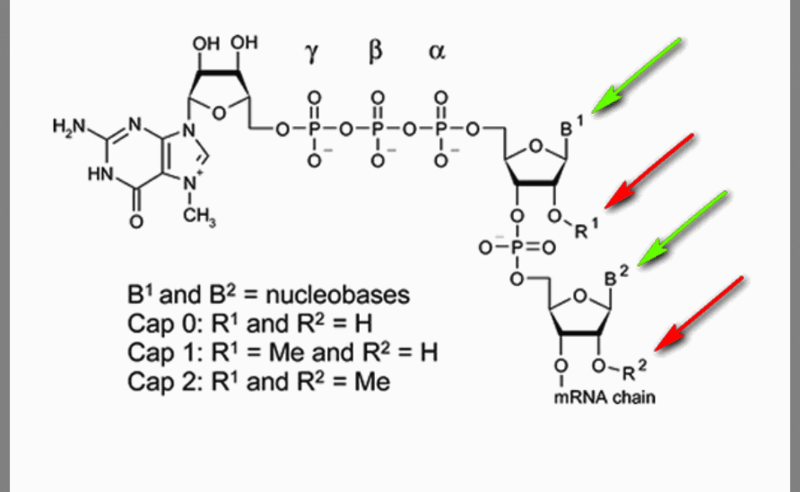 The fact that viral polymerases no 7-methyl molecule on G-Cap, allow a specific distinction between “foreign” and “endogenous” RNA – an RNA which only one cap carries the triphosphate at the 5′-end, can be used as evidence of Infection apply. In fact, there is the innate immune system (its fundamental task, the distinction between “foreign” and “self” is) with RIG-I an intracellular receptor, exactly this structure as PABP detects and subsequently triggers an antiviral immune response.